Yes, you read it correctly. I typed three exclamation points in the title. That is how strongly I feel about interactive whiteboards. Let me tell you where that comes from. It was my first international school and they were doing a quick tech presentations (setting up email, our electronic grade book, etc.) One of those presentations was with the school’s new Promethean Interactive Whiteboard. At first blush I was impressed. I really was and wish I had one in my class. There appeared to be endless possibilities for student engagement. It seemed like a perfect marriage of technology and education. A great compliment to great lessons. That’s the problem. The interactive whiteboards are not complimentary to lesson plans. In order for them to be effective, in my opinion, the interactive whiteboard has to be the center of the lesson and you have to use it all the time. You may ask yourself Patrick, what’s the big deal? I am so glad you asked. Let’s start with the menus. Dear God the menus. There are way too many of them. Just to bring up that coordinate plane, it would take 3-5 clicks (or taps using the pen). You have to go from menu, to menu, to menu to find something and if you didn’t know where it was and had to looking forward then you have a few minutes of dead air in your classroom. Then there is the alignment and calibration. Calibrating the pen for the boards is usually quite easy, but if the projector is not properly installed, sometimes calibrating the pen can be a real pain. The reason is, the software usually has places for you to tap with the pen in order to make sure when you place the pen on the board it lands true and makes the selection or annotation that you want to make. You see good reader, if the projector is installed incorrectly or not set up well enough, then those calibration targets may be on the border of off the whiteboard all together making accurate calibration a pipe dream. Sometimes, this can be remedied with a quick adjustment on the projector, but there are other times, when the projector itself will have to be moved and remounted – a time consuming and depending on your interactive whiteboard provider could be an additional cost. Now these costs differ from vendor to vendor and depending on your particular contract. I am going to say $5,000 per unit which includes a projector. If you pay more than this, please don’t go to your vendor, show them this piece and say Hey bub! What’s the dealio? I’ve known schools who pay much more just because of their location and services available. Now, one thing that most schools don’t think about is the long term with these devices. Once it is installed and working properly it will take care of itself. Like a refrigerator or a stove. This is true . . . for a while. The very first time you turn on the projector, the picture will look great (at least I hope it does). However, if you compare day 1 to day 50 to day to day 365 you will notice that the picture will be dimmer each time. It’s just how light bulbs work and that is the heart of that projector. When that light bulb goes out, you need to replace it. These bulbs are not cheap and if you’re replacing 20% of your bulbs every year, then your costs go up. Be sure to tack that onto the original budgeted item. As you can see these costs can add up quickly. So there are my problems, so what can schools do about this? What options do they have? Schools and teachers don’t want to not have an interactive display in their room. It looks good for parents and guests walking through the halls. There are some teachers who do use them. There are alternatives out there. There are interactive displays (no projectors) that can replace your school’s interactive white board. The advantages to these boards are numerous. Microsoft makes one called the Surface Hub which comes in two sizes – 55″ and an 84″ Their prices are $9,000 and *gulp* $22,000. Yeah that second price is a little hard to swallow. If your school is on Office 365 it might be worth considering and there may be a discount. It does some neat things too and would be great for Skype in the Classroom. Google has the newly minted Jamboard (what a terrible name) made by Benq for $5000 which looks pretty promising. This is more of what I am talking about and while 55″ isn’t as large as I would like and the rolling stand is an extra $1000 and of course what would an IT product be without licensing which you have to pay every year. However, add all that up and I still think the Jamboard would win out over a traditional interactive whiteboard. Bottom line is I don’t like them. They don’t deliver on their promise of really enhancing a classroom. They are too cumbersome to use and just not super effective. What do you think? Leave those comments below! This entry was posted in Opinion, Patrick Cauley and tagged interactive whiteboard, jamboard, microsoft hub. Bookmark the permalink. 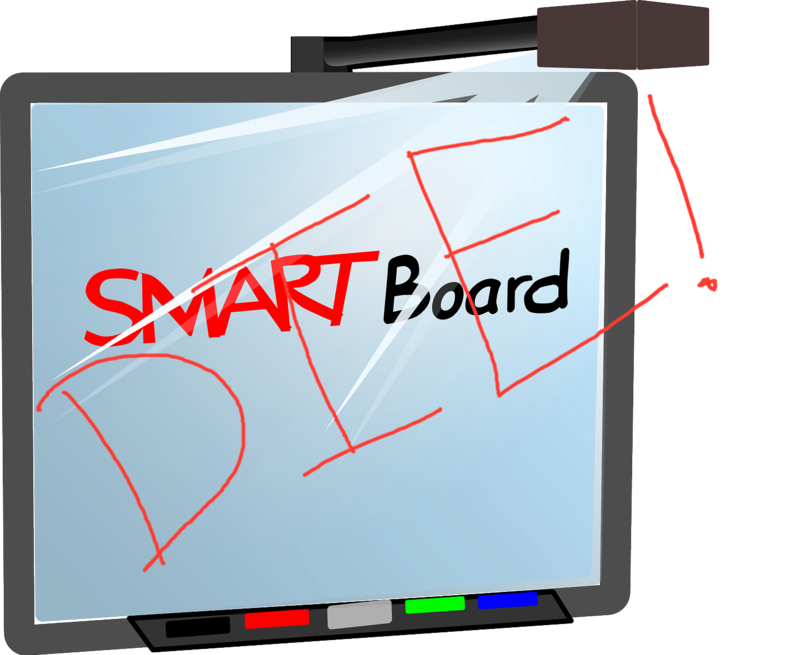 5 Responses to Interactive whiteboards should DIE!!! I tend to believe that interactive projectors are typically more ‘teacher centered’ devices. I would much rather see money spent on ‘student centered’ devices. Personally, I’m in favor of a ‘dumb’ projector or panel that can be used for display purposes. Use the money that is saved toward student devices. Agreed. There is no data that these improve teaching and learning. A decentralized room is what is needed. In fact, the goal should be that teachers and students can easily display their devices on ANY screen in the space. This is what I am working on now at my new school. Patrick, I agree with your conclusion. In my 15+ years of experience in educational technology interactive whiteboards fit into my “gadget” category. They belong in the same dumpster pile as thousands of other gadgets that make big promises about improving education and learning, and due to the reasons you have described above, they don’t. I admit to becoming quite pessimistic about MOST educational technology. There are to many things (see below) a school, teacher, and learner need to “get right” in order to realize the promised benefits of the product. Bill thanks for the comment and the link. That is a guideline I think all school leaders (not just in IT) need to understand. What baffles me is how strongly some people will cling to their un-used interactive whiteboard. I had one teacher who did not want to give his up because he “might” use it one day.